Yesterday we in the Western Church (Roman Catholic and Protestant) observed the Feast of the Epiphany (Greek for Manifestation or revelation) and heard the story of the visit of the magi to Bethlehem. The Orthodox Church celebrated Epiphany as the Baptism of Jesus, which we in the West will celebrate this coming Sunday. In addition the story of the Wedding Feast at Cana (recalled in 2 weeks) was noted in the early Church as an Epiphany Feast because there Jesus is revealed as Son of God. All three of these events have profound meaning but to me the account of the visit of the Magi is rich and filled with meaning. It has also inspired several spinoff stories such as Ahmal and the Night Visitors which I took the time to view last night. I highly recommend it. Did this event really happen? I like to think that it did in spite of the fact that there have been many embellishments. Matthew's Gospel 2:1 simply tells us that magi from the east arrived in Jerusalem asking the whereabouts of the newborn king. Notice that it does not say that they were kings, nor does it say there were 3. It was most likely easy to designate 3 as the number because there were 3 gifts--gold,frankincense and myrh.Early Church writers tell us that the gold was for Jesus as a king, the frankincense was to worship him as God and the myrh was for his burial. Also as early Christians who were still practicing Jews hear the Scriptures read in the synagogues they heard, for example, from the prophet Isaiah, "All from Sheba shall come bearing gold and frankincense, and proclaiming the praises of the Lord." (Is 60) Psalm 72:10 says "May the kings of Tarshish and the Isles bring tribute, the kings of Sheba and Sela offer gifts." In any event the meaning of the event is that Christ is revealed as Messiah not only for Israel but for all peoples. For me this does no mean a triumphalist imposing of Christianity on all bur rather is a call to realize that God loves all and in Christ draws all to himself. Also I see the star as the light that draws all to Christ who is the Light of the world and who chooses to dwell in us that we may be light. Finally in the 3 gifts, indeed symbolic but most importantly sign of generosity. 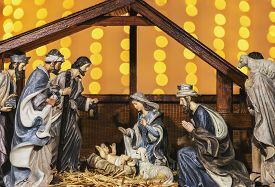 This account is what inspired the practice of Christmas gifts (which in many countries waits until January 6, but most importantly it should inspire us to be generous with the gifts that God has given us. The above mentioned story of Ahmal certainly points us in that direction.